Liaoning Province in China is known for the substantial amount of dinosaur fossils that’ve turned up in the dirt there. Over the years everything from insects to fish to plants have been discovered in such detail that even skin textures have been left behind in the rock. 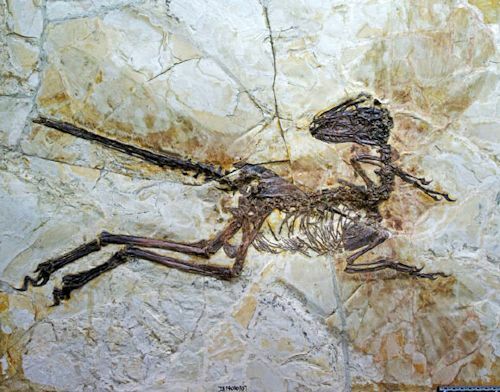 Now it appears that a new feathered dinosaur that is cousin to the Velociraptor can be added to the long list of discoveries there. The new dinosaur with a ridiculous name to try and pronounce, Zhenyuanlong suni, stood at about 5 feet tall, had wings too short to allow them to fly and some of the most complex feathers seen on a dinosaur up to this point. The feathers’ complexity is clearly visible on the rock that the near-complete skeleton has been found in and resemble the feathers of today’s eagles. It’s also hugely terrifying to think of these semi-flying, feathered 5 foot dinosaurs tracking you down to feed their young. Wombats are like the koala’s derpy ground-dwelling brother. They’re harmless, adorable and just keep their noses to the ground without being a bother to anyone. They’re about the size of a small, fat, over-inflated dog/gopher hybrid that like to build extensive burrows and tunnels. 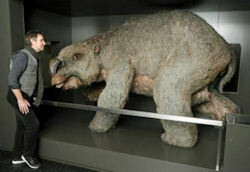 Wombats used to be about the size of a Prius. 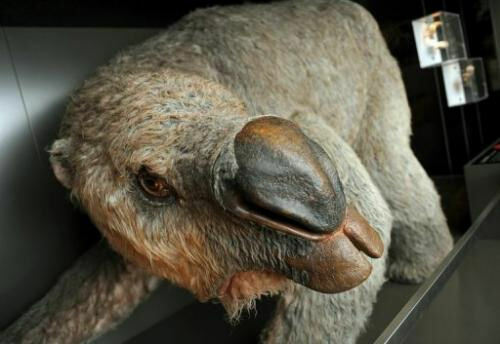 In a remote part of the outback in Australia, almost 50 prehistoric mega-wombats called Diprotodons have been discovered in what’s being called a ‘graveyard’ for these giant animals. As researchers uncover more of the site, the conditions of what brought the animals together in one place is becoming clearer…and creepier. Also found at the site? 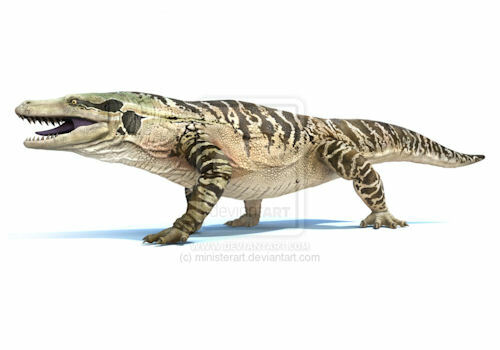 The bony back-plates of a massive ancient crocodile and the teeth of an 18-foot-long venomous lizard called megalania. Awesome! Hear the Sounds of Dinosaurs! In the movie, Jurassic Park, sound designer Ben Burtt tried to create what he thought prehistoric beasts might’ve sounded like when they walked the Earth. Using currently existing animals and a little exaggeration, no one will ever forget the sounds Uncle George’s sound guru created. Now an art installation in France created by Marguerite Humeau is bringing us as close as we may get to what they might have actually sounded like and it’s pretty awesome to hear. Because the vocal chords are made of soft tissue, Humeau has spent years working with researchers in various fields from throat specialists to engineers to paleaontologists to get everything in order to recreate as accurately as possible. Humeau also gathered data on these particular animals current ancestors: an Asian Elephant for the mammoth, dolphins and harbors porpoises for the ‘walking whale’ (which is pretty damn frightening to consider this whale had ridiculous teeth…and it walked) and a wild boar for the ‘hell pig’ (again…frightening). Why are you still reading this? Press play and listen to what it might’ve sounded like 50 million years ago when a ‘hell pig’, a ‘walking whale’ (again…a walking whale..with freakin’ teeth) and a mammoth just casually strolled the planet. Posted in Animals, Creature, Dinosaurs, Fossils, Jurassic Park, Mammoth, Sea Creature | Comments Off on Awesome! Hear the Sounds of Dinosaurs! “Bone Devourer” Worm Disolves Bone By Puking Acid! 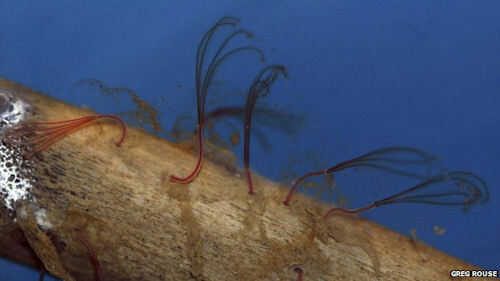 It’s like Ridley Scott had a hand in designing worms. Those dainty little flower-like objects in the picture above are anything but dainty little flower-like objects. Those things are worms of the Osedax (Latin for “bone devourer”) family of wormy beings. Those things aren’t just resting there either…they’re actually throwing up acid and trying to get at the marrow inside the bone! Species of osedax have apparently been around forever but only discovered by researchers as recently as 2002 at the Monterey Bay Aquarium in California. What’s putting them back on everyone’s radar are new findings about something that’s been bugging researchers since they were discovered…How does a creature with no mouth attach, bore and extract nutrients from something as hard bone? A fresh look at the osedax has revealed something ripe for a low-budget science-fiction film. Using a technique not unlike Jeff Goldblum’s ‘BrundleFly’ vomit-drop from the film The Fly, the worms basically attach to the bones using root-like appendages which secrete a green, acidic enzyme on to the bone that then breaks down the tissue so that the worm can continue burrowing and extracting the nutrients it needs. Since their discovery in 2002, seventeen species of the worm have been found off the coasts of California, Japan and Sweden. With this new research, a three million year-old whale fossil collecting dust in Italy has been given a second look and it appears that the burrowing pattern on those bones are a match for the burrowing patterns of the osedax worms. The figure of pure terror you see before you is not the mascot of an arena league football team. 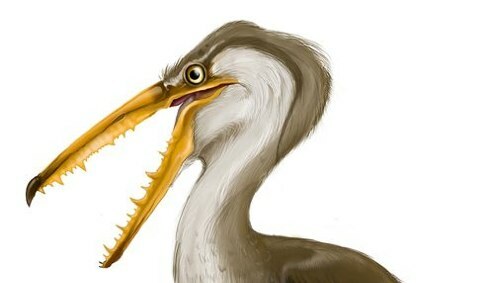 Rather, it’s the artist rendering of an ancient seabird which once roamed modern-day Chile. Fossils of the creature were recently discovered just in time for nightmares to begin. Thanks to Weird Things reader Darcy for the tip. You are currently browsing the archives for the Fossils category.